The central goal of health outcomes assessment is to measure the results of treatment that patients experience and the outcomes of the care we deliver. 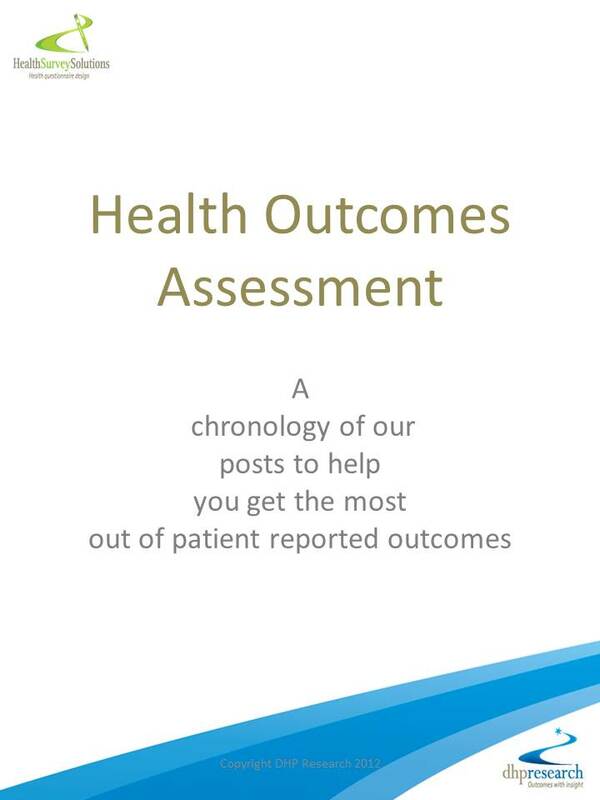 This brief document provides a chronological links to a selection of our postings from www.thepatientoutcomesblog.com from 2013 to the present which we hope will be of practical use to researchers and practitioners undertaking health outcome assessments which focus on patient reported outcomes and experience. The first and most important thing you must do is have a plan based on the following questions you need to ask yourself. Research is the process of identifying a question, or questions, choosing and applying the most suitable method for collecting and analysing the information to answer the question and finally disseminating the findings for the benefit of others. Development has been defined as ‘…the systematic evaluation of the application of the results of research in practice’. With the recognition of the importance of understanding the psychological impact on living with diabetes, there is now a range of diabetes specific patient re- ported outcome measures (PROMs) designed to assess the various constructs associated with the impact of living with diabetes and its treatment on quality of life, well-being, health status and treatment satisfaction. Learn the basics behind questionnaire design to ensure your survey collects relevant, reliable and valid information. Whichever way questionnaires are used and for whatever purpose, the objective is to obtain reliable and valid information on the patient’s experience and reported outcomes. Below are some pointers as to why patient experience surveys can fail in providing useful information. Building personas for the target population can help improve the way we design the questionnaire, the language we use, the questions we ask and overall the way we communicate with respondents. Look at any paper or presentation reporting the development or use of a patient reported outcome (PRO) measure and without doubt there will be an array of statistical significance levels, standard deviations, standard errors and correlation coefficients in an attempt to help us understand what the data is telling us. But, is the application of classic statistical methods really telling us what we want to know? Maintaining high levels of patient recruitment, adherence and retention is essential for the successful completion of a clinical trial, yet it remains a significant challenge faced by researchers. Are Practice Managers Asking the Right Questions? Patient surveys are now an essential tool for general practices to assess the level of patient satisfaction and experience of their services and is the one consistent dimension across a range of domains considered essential in the measurement of the quality of care provided by general practice. Despite this it is not uncommon that the task of developing the practice questionnaire is the responsibility of the practice manager who may have little or no knowledge of questionnaire design best practice. In 2006 the DAWN study (1) confirmed what many health care professionals and people with diabetes have known intuitively for years: that diabetes causes multiple psychosocial problems, that these issues are barriers to achieving adequate glycemic control and interfere with patients quality of life. Are we too reliant on traditional health research methodologies? New research methodologies can lead to significant breakthroughs and insights, but health research still does not utilise this potential. Despite the amount of creative and inspirational research such as co-creation, crowd sourcing, ethnography, co-research, semiotics, cultural mapping, their use in health-related research is virtually non-existent. The emotional impact of diabetes effects the individual and family leading to denial, poor treatment adherence, eating problems, restrictions in daily living, fears of hypoglycaemia and complications such as blindness, heart disease, sexual dysfunctioning and premature death. What is the value of mapping the patient’s journey? An experience map is a tool that enables the identification and presenting key insights into patients interactions across the various services and touch points. Diabetes has rapidly become a global epidemic affecting more than 300 million people and is expected to increase to 438 million people by the year 2030. As such, biopharmaceutical companies and researchers around the world are working to identify new, effective and safe treatments to help this growing patient population. As a consequence patient reported outcomes (PRO) measures are increasingly being used to measure health status, quality of life, and the economic burden. People working in health care are generally familiar with the concept of patient satisfaction; although there is often confusion with this and patient experience. However, how useful is a measure of patient satisfaction and can it really tell us anything? With increasing involvement of the patient in the care received, patient reported outcome (PRO) measures are increasingly accompanying the traditional clinical ways of measuring health and treatment effects. Patient self-completion questionnaires are now an essential component in the measurement of patient experience and satisfaction. Executed correctly, they can help you to get a much deeper understanding and insight into the experiences, attitudes and behaviours of your patients. Used increasingly in the development of questionnaires to detect questionnaire items not understood by respondents, cognitive interviews can be used to revise and develop patient reported outcome (PRO) measures and patient reported experience questionnaires (PREMs). Investigating the minimally important difference of the Diabetes Health Profile (DHP-18) and the EQ-5D and SF-6D in a UK diabetes mellitus population. t is important to know what patient reported outcome measure (PROM) scores relate to a meaningful change in health status across time. The aim of this study was to investigate the minimally important difference (MID) of the Diabetes Health. The diabetes mellitus (DM) marketplace is becoming saturated with multiple medications in both the insulin and pre-insulin space, particularly as analogues start to lose their patents. Differentiation in clinical outcomes within classes is often unclear or minimal. So, differentiation of therapeutic options is likely to focus more on frequency, mode and method of administration, as opposed to statistically significant differences in glucose control, which are clinically relevant. Despite the increasing use of PROMs across a range of clinical settings and research, there are a number of important issues that remain to be addressed before we can maximise the benefits from their use such as in routine care. ‹ Should we have an opt-out choice available on our online survey?